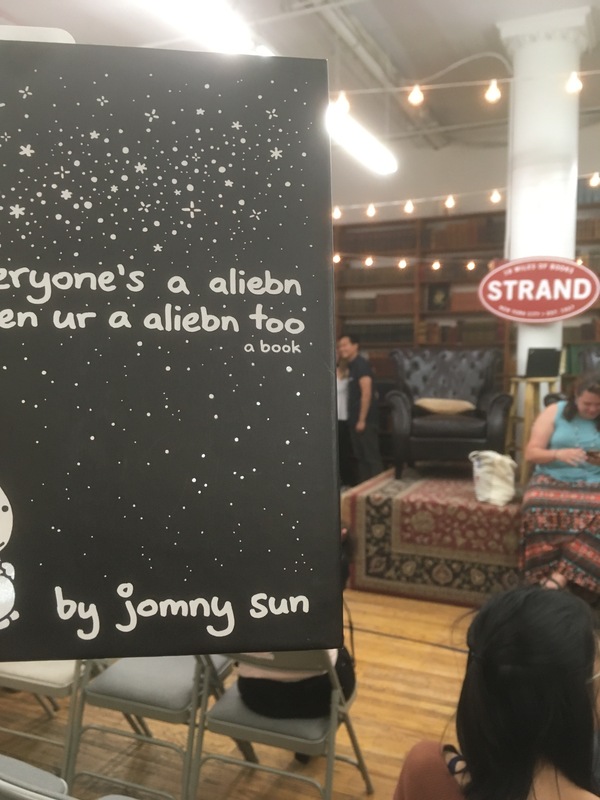 If you follow me on Twitter then you probably already know that I am a huge fan of the “aliebn confuesed abot humamn lamgauge” otherwise known as @jonnysun. Jonny (or jomny) has been killing it on twitter since at least 2012, when he started out as a normal guy trying to fit in with the established menagerie of strangely named cartoon-avatar accounts now collectively referred to as “weird-twitter” (with a hundred quotes around it, according to Jonny). Jonny’s new book, and a blurry Jonny taking a photo in the background. Yesterday afternoon I had the immense privilege of going to The Strand to witness (video of the event is available here) Jonny’s first event on the book-signing tour for his first ever book “Everyone’s a aliebn when ur a aliebn too” that released the same day. The book is a wonderful graphic novella that details the adventures and musings of an alien sent to investigate and study humans on Earth. The conversations that alien-jomny has with various plants and animals (as well as Nothing) range from cute to devastatingly existential, and are largely based on some of his most beautiful tweets and Instagram captions. The event started with the inimitable Sarah Kay reciting a poem on art and creativity and then interviewing Jonny, her friend, about his life’s work in the various fields of architecture, play-writing, tweeting, comedy, writing, drawing, and many more activities on top of his engineering Ph.D work that officially takes most of his time. More than a hundred people packed into the rare-books department of The Strand and participated in the discussion, asking questions, and having Jonny narrate the first bit of the book to us from a projector screen. Sarah Kay’s line of questioning started by asking Jonny where the alien persona originated. Jonny responded that he, as an Asian-Canadian, learning with his family how to fit in with North American culture, has always felt like an outsider and alien, and that his mixed experience trying to meld engineering and the various arts has left him feeling like an alien to both sub-cultures whenever he tries to bring the two together. Jonny isn’t bitter about this alienness, seeing it as a gift rather than a curse, as it has taught him how to empathize with people who are different than him, seeing as almost everyone shown on TV or in the movies doesn’t look like him. I greatly appreciate his ability to empathize and how he is able to artistically convey it through his writing, be it through his 140 character tweets and conversations on Twitter, his Instagram captions, or through his incredible, just-published book. Jonny’s writings have helped me to see the world through alien eyes and appreciate alternate perspectives far better than my upbringing would otherwise have allowed. 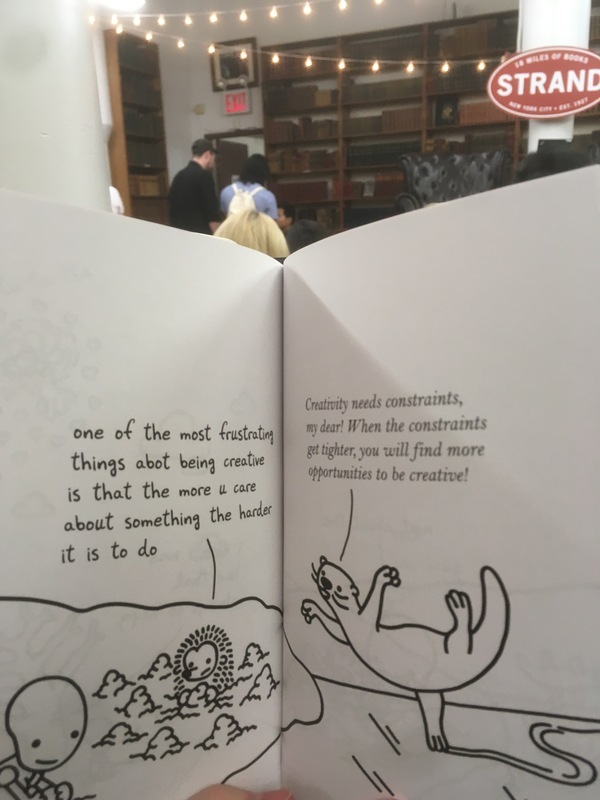 An excerpt from Jonny’s books extolling the creative power of constraints. Jonny has taken the experience gained through his alienation and gifted it to his hundreds of thousands of readers, and he welcomes his responsibility as to be a role-model and success-model for Asian-American people, starting by making sure that he fosters a safe and wholesome space on Twitter, with that branching into the many other aspects of his creative as well as professional work. Jonny and Sarah talked about how part of the power that comes with Twitter actually rests in its anonymity, aside of course from the negative repercussions most exemplified by the likes of YouTube comments sections. Because of the anonymity that comes with Twitter it is possible to participate in a different kind of community from what we normally experience, there are no geographic boundaries, and the kinds of things you can say are only limited by the character count. And that character count really serves less as a hindrance and more as a boundary to facilitate and nurture the art and humor that has made Twitter so famous. haha wowe limke harrey poter ! jus lieke harbey pobtre !!! I mean, how else would it be possible to talk about the death of parents and be insanely hilarious at the same time? Jonny has taught me that it is ok to take things seriously, and that throwing in some humor to your existentialism can make a huge difference. Jonny, on the necessity of sadness for happiness to exist. One important way that Jonny’s story resonated with me is how he struggles with loneliness. He said that this book was born out of one of the loneliest parts of his life. He and I both have experienced the loneliness of being surrounded by people who are smarter than us, in tough and stressful academic settings, fighting imposter syndrome for not fitting in with any of the crowds we like to associate with and struggling with maintaining long-distance friendships. Perhaps this similarity is what has kept me hooked on every word he wrote. He has definitely had a huge impact on me over the last two years of graduate school, helping me to identify my loneliness and own it as an asset and way to get to know myself better, rather than seeing it as a burden and obstacle to some distant true happiness. I credit this Instagram caption with opening my eyes to the validity of doing things alone, like going to the movies or eating by yourself. i spend most of my time alone. or, i spend most of my time by myself. that doesnt mean im lonely. necessarily. but it does mean that i open myself up more to opportunities to feeling lonely. right now im eating dinner by myself in a crowded restaurant. i've gotten used to the slightly stuttered "for… for one?" that i usually get at the door, and i've gotten over feeling self-conscious about sitting at a table meant for two people (because let's face it, very few tables are designed for one person), and opposite an empty chair (most servers will remove the second person's place setting and silverware but really perceptive people will also take away the chair). i've learned that being out by yourself is not a sign of weakness, or something to be judged over. all those pressures for me were internal. i was afraid of being judged because i was afraid of being alone. now, i truly encourage all my friends to go out and spend time with themselves by themselves. if thats scary to you, you should try it. you learn to be confident and comfortable with who you are. and unapologetic in your own body. you should never have to apologize for being present. and once you learn to be confident taking up space and ALSO not making any noise, i think you can be comfortable basically anywhere (as a side note, i think the loudest people are often the most insecure). i do often wonder or worry if i am commodifying my own solitude by writing. but at the same time, i realize that no writer or creative person has ever produced anything while also interacting with and entertaining others, and that comforts me. i close my eyes and feel a great invisible bond tying together this group of people who must be alone in order to work. that is, by nature, a prerequisite to making anything. by spending time with myself and enjoying it, i like to think that its a more of an active choice than a passive default. it gives my solitude agency in a way that affirms that this is something that i choose to do and that i want to do and that i enjoy doing. even if that's not always true. It may be tempting to look at the success of someone like Jonny Sun and think that you cannot achieve nearly as much. However, Jonny said that the key is not to focus too intently on just one thing, but to resign yourself to the slow and steady approach, remaining dedicated to many things and making sure that they all get some amount of attention, encouraging us that with enough time most things are possible. His advice to use creative projects as a means of combating loneliness and insecurity is even part of what motivated me to start this website. Personally, it was great to take a Tuesday afternoon to visit the city and see a few friends over coffee and get a nice pep talk from one of my favorite online personalities, offline and in the real world. JI got to hang out with Jonny’s brother Chris for a bit, who is a really cool guy and is also working on an engineering Ph.D, and even Lin-Manuel Miranda showed up for a few seconds to get a picture with Jonny. I would encourage everyone to get their hands on the book, or to at least read through a collection of some of Jonny’s best tweets if you get the chance. 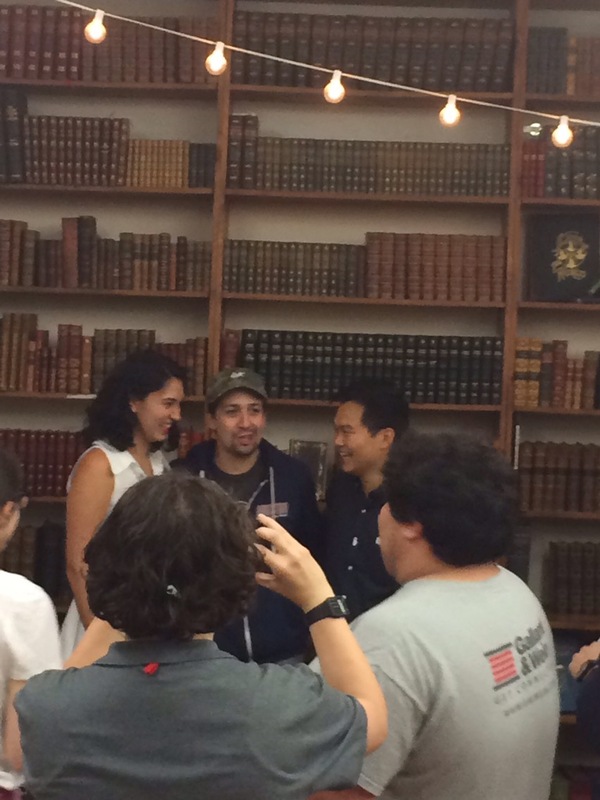 Sarah Kay, Lin-Manuel Miranda, and Jonny Sun, at Jonny’s inaugural book signing at The Strand.